In 1919, Congress passed the 19th Amendment, which granted American women the right to vote, and a year later it was ratified. There is no denying that these are seminal dates in American history. Even so, nearly 100 years later, the struggle for equality continues. It is not only about equal pay for equal work. It is also about rewriting the cultural script that says a woman's worth is determined by her size and the texture of her hair. It's about de-normalizing attitudes that say if a woman's dress is "too short" or the neckline "too low," then she is asking to be harassed or assaulted. Relegating women’s history to one month per year means that gender equality is still elusive. Until it is entrenched in our society, then setting aside one month to honor women’s history will, at least, shine a light on stories that have gone untold for too long. These are boon times for new books about amazing women. Examined here are titles published in the past year that showcase women’s physical and intellectual strength, their bravery, and their sense of social justice. Athletes Bildner, Phil. 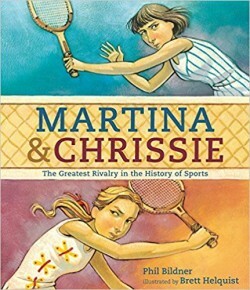 Martina and Chrissie: The Greatest Rivalry in the History of Sports. illus. by Brett Helquist Candlewick. Mar. 2017. $16.99. ISBN 9780763673086. Gr 2-4–Some might debate this book's subtitle, but no matter—this is a terrific story. Employing an enthusiastic, conversational tone and a healthy dose of exclamation points, Bildner describes briefly how the very different personalities of Martina Navratilova and Chris Evert shaped their respective tennis styles. The author also describes the intense rivalry of the two on the court and the warm friendship they developed off it, despite the chilly relationship between their native countries. Tension arose when Navratilova’s new coach discouraged her friendship with Evert, but the narrative ends with a reconciliation. Using acrylics and oil, Helquist renders stylized figures. Light and shadow create drama, as do the women's facial expressions. A more detailed account of the players' careers appears in an appendix. All in all, an exciting story about two brilliant athletes. Copeland, Misty. Life in Motion: An Unlikely Ballerina. Young Readers Edition. S & S. 2016. $17.99. ISBN 9781481479790. Gr 8 Up–Copeland's position as the first female African American principal dancer in the American Ballet Theater did not come without a price. She discusses the hardships, sacrifices, and fears that were integral to her journey. In a self-effacing, matter-of-fact style, the ballerina relates moments from an unstable childhood in which her mom bounced around from boyfriend to boyfriend, bringing Copeland and her siblings along. Copeland describes standing at the barre for the first time and how quickly she excelled. Juggling family issues and rigorous dance was a struggle, as was dealing with the hostile custody dispute between her biological family and unofficial adoptive family. Then there was the issue of race. Copeland states that she and another African American dancer “were used to having to explain ourselves as black people—not just in life, but also in the incredibly white world of ballet. 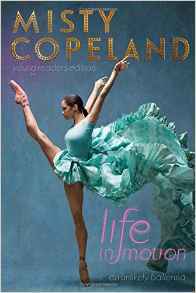 We knew we were expected to ignore the hurtful things that people said.” Though aspiring dancers will flock to this book, other readers will be drawn in by Copeland’s story of her meteoric rise and her genuine voice. Macy, Sue. 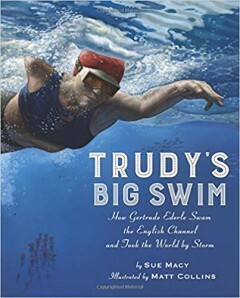 Trudy’s Big Swim: How Gertrude Ederle Swam the English Channel and Took the World by Storm. illus. by Matt Collins. Holiday House. Feb. 2017. $16.95. ISBN 9780823466651. Gr 1-4–Macy takes the facts of Gertrude Ederle’s career and fashions them into an articulate, fascinating account. The book begins with Ederle as she makes her way through the English Channel on the day of her momentous swim in August 1926. Immediately, the author rewinds the story to earlier that morning when the swim began, explaining why swimming the channel was such a challenge, and relates the early days of Ederle’s career. After describing the painstaking planning and training that went into the swim, Macy then shifts the narrative back to the historic event. From the outset, readers will be hooked by Macy’s vivid, descriptive writing. Details such as Ederle’s application of coats of grease to her skin to ward off the cold and her lunch of broth and chicken while treading water will enthrall kids. In his exquisite illustrations, Collins’s artwork employs unusual perspectives, giving readers the impression that they are right there with Ederle, whether she is battling fatigue in the water or flanked by reporters and camera flashes at the finish. A first-rate book. Smith, Matthew Clark. Lighter Than Air: Sophie Blanchard, the First Woman Pilot. illus. by Matt Tavares. Candlewick. Mar. 2017. $16.99. ISBN 9780763677329. Gr 2-5–Before Bessie Coleman and Amelia Earhart, there was Sophie Blanchard. From the time she was a child, Blanchard was fascinated with flight. In France, in 1805, she became the first woman to go up in a hot-air balloon by herself and steer her own course. After that, she regularly made flights, with and without her husband. Smith’s word choices and phrases help convey the woman's passion for flight and its dangers: “the shudder of the shifting wind,” “they shared something as wide and deep as the sky,” “she watched the birds swooping and dancing,” and so on. Tavares’s pale, dreamy illustrations are the perfect complement to the story. A gentle wash of blue and yellow tones pervade most scenes as if wrapping everything in sky. Several illustrations show Blanchard in flight. The vast skyscapes and visions of rooftops help convey her sense of wonder and elation. An elegant, thoughtful look at an under-recognized adventurer. Activists Frier, Raphaële. Malala: Activist for Girls’ Education. tr. from French by Julie Cormier. illus. by Aurélia Fronty. Charlesbridge. Feb. 2017. $17.99. ISBN 9781580897853. 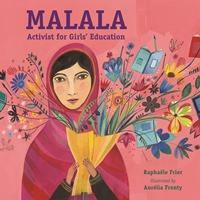 Gr 2-5–In this translation of Malala: pour le droit des filles à l’éducation, evocative narrative details make reading about Malala Yousafzai’s life a sensory experience, from the taste of cardamom tea to the sound of a favorite song to the sight of girls attending school. Emotions that stand out are the constrictive fears wrought by the Taliban’s actions and attitudes and Yousafzai’s compassionate response promoting peace and education for all. Excerpts from the young woman’s blog and her speeches are woven into the narrative. The profundity of her words and her actions propel her story into the present day. Fronty’s bright and stylized illustrations are suggestive of folk art. Death and violence are handled with utmost sensitivity, making this appropriate for older elementary school students. A beautiful and important book. Kops, Deborah. 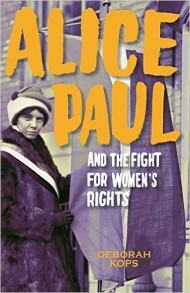 Alice Paul and the Fight for Women’s Rights. Calkins Creek. Feb. 2017. $17.95. ISBN 9781629793238. Gr 6 Up–Extensively researched and thoroughly documented, this book is a terrific resource for information about Alice Paul's life while also detailing the call for a constitutional amendment guaranteeing women’s suffrage. One story cannot be told without the other. Kops recounts Paul’s childhood days in a Quaker community in New Jersey, her college days in England, and her time spearheading the movement to secure a woman’s right to vote. The author depicts the woman as a firebrand, surely, but also someone who was deeply conflicted. While Paul was willing to be imprisoned and force-fed to advance suffrage for white women, she allowed herself to be persuaded by others to disenfranchise black women. (When staging a parade, Paul said that she “no longer wanted anyone to encourage black women to march” for fear of alienating prominent white Southern suffragists.) Kops describes Paul’s life post–19th Amendment as well, including her role in the second wave of women’s rights activism of the 1960s and 1970s (writing the Equal Rights Amendment). Occasional black-and-white photographs round out this excellent biography. 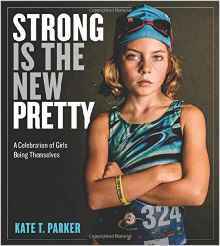 Parker, Kate T. Strong Is the New Pretty: A Celebration of Girls Being Themselves. Workman. Mar. 2017. $18.95 pap. ISBN 9781523500680. $30. ISBN 9780761189138. Gr 4-7–With this book, Parker expands brilliantly on her 2015 online photography series of the same name. Here, she presents 150 full-color and black-and-white photographs of girls ranging in age from five to 17, engaged in a variety of activities: dancing, swimming, running, playing, pretending, daydreaming, and more. Each photo is accompanied by a quote from one of its subjects. The quotes, like the images, reflect a kaleidoscope of concerns, interests, and beliefs about the individual and the world. Alice, age seven, is shown wearing a glittery princess dress. Her hair flies as she busts out her best dance moves. Her quote reads, “I like to put on shows. It’s my favorite thing. I am really good at it.” Harley, age 10, is shown hitting a tennis smash. Her quote reads, “Be a good sport and have a positive attitude. When you walk off the court, no one should be able to tell if you won or lost." Those seeking inspiration will find it in abundance here. Stone, Tanya Lee. Girl Rising: Changing the World One Girl at a Time. Penguin/Wendy Lamb Bks. Feb. 2017. $22.99. ISBN 0553511468. 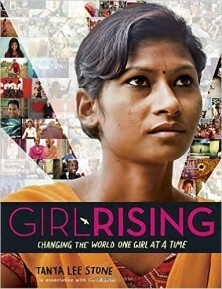 Gr 8 Up–This expansion of the 2013 documentary Girl Rising features the nine girls from the film, plus an additional 25 from around the world. The majority of the volume consists of interviews with the subjects, who frankly describe the obstacles to education that they have overcome: poverty, slavery, child marriage, and cultural norms that dismiss girls as not worthy of education. The details are harsh. Suma, from Nepal, was six when her family sold her into slavery; she had to “sleep in the goat shed, and wear rags, and eat scraps from dirty plates." Sokha, from Cambodia, lived for years in a “steaming garbage dump teeming with flies, maggots, and mosquitoes.” Ultimately, this work is about the girls’ resilient spirits and their commitment to bettering their lives and the lives of others. Vibrant and expressive full-color photographs fill the pages. A book of rare and expansive acuity. Weatherford, Carol Boston. Dorothea Lange: The Photographer Who Found the Faces of the Depression. illus. by Sarah Green. Whitman. Feb. 2017. $16.99. ISBN 9780807516997. Gr 1-4–Weatherford’s account of the photographer’s life is both articulate and sensitive. 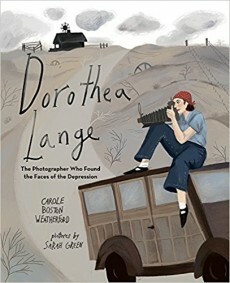 The very qualities that affected Dorothea Lange adversely as a child became the impetus that led her to her career path. For instance, Weatherford explains how a childhood bout with polio left Lange with a limp. It was this and the resulting name-calling and teasing that she endured that helped her to understand “how those less fortunate felt without ever walking in their shoes.” The artist’s empathy also allowed her to notice people and preserve on film encounters with those who were largely ignored or neglected by society. Green’s slightly stylized illustrations incorporate a gray-toned palette with occasional injections of reds and blues: the grays reflect the Depression-era history Lange documented, while the dashes of color offer glimpses of life and hope. A first-rate picture book biography. Artists Blumenthal, Deborah. Fancy Party Gowns: The Story of Ann Cole Lowe. illus. by Laura Freeman. little bee. Jan. 2017. $17.99. ISBN 1499802390. Gr 1-4–In a conversational tone, Blumenthal relates how Anne Cole Lowe grew up creating beautiful things with fabric and thread. Discrimination was also part of that childhood. A refrain in the narrative suggests, “That didn’t stop her.... She thought about what she could do, not what she couldn’t change." 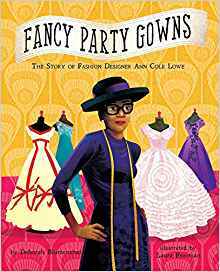 The author points out that whether being told to use a back entrance because of her skin color, forced to study in a separate classroom at design school, or dealing with the consequences of the future Jacqueline Kennedy’s ruined bridesmaids’ dresses that she had been commissioned to design (along with her wedding dress), Lowe stayed focused and shaped a phenomenal career for herself. Freeman’s illustrations are bright and colorful. Her interpretations of Blumenthal’s designs appear throughout the book, each one exquisitely detailed. An inspiring story about an extraordinary tastemaker. Harvey, Jeanne Walker. 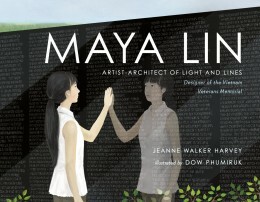 Maya Lin: Artist-Architect of Light and Lines. illus. by Dow Phumiruk. Holt. May 2017. $17.99. ISBN 1250112494. Gr 1-4–In free verse, Harvey describes how family, nature, education, and travel shaped the creative vision of Maya Lin, the artist and architect who designed the Vietnam Veteran’s Memorial in Washington, DC. The author explains how Lin entered her idea for the memorial in a competition and how surprised, even angry, some of the judges were when they discovered the winning proposal was submitted by a woman who was still in school. Perhaps most interesting of all is the account of how the architect came up with her proposal. She visited the site, and “in her mind, she saw the cut in the earth/healing over time to a polished edge/covered from top to bottom with names/an edge that reflected sky and grass/and the people who visited the memorial.” Phumiruk's digital illustrations feature soft, opaque colors that contrast brilliantly with the glossy black of the memorial images. Informative, important, and elegant. Scientists and Mathematicians Gonzales, Andrea & Sophie Houser. 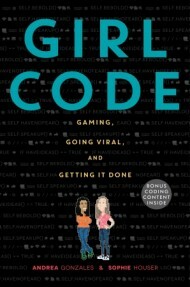 Girl Code: Gaming: Going Viral, and Getting It Done. HarperCollins. Mar. 2017. $17.99. ISBN 9780062472502. Gr 8 Up–Gonzales and Houser describe how they met at a Girls Who Code summer conference, what they learned there, and how they coded their way to fame with their game Tampon Run. The women maintain a light, conversational tone throughout the book, and teens will be charmed by their modesty and impressed by their formidable intelligence. While this is ultimately a success story, the coders share personal struggles (Houser’s fear of public speaking) and setbacks with the creation of Tampon Run (Gonzales’s trial-and-error efforts to animate Luna, the Tampon Run heroine). Occasional photos of the authors adequately supplement the text. Inspiring, engaging, and a lot of fun, this title will find a wide audience. Sample the book here. Lawlor, Laurie. Super Women: Six Scientists Who Changed the World. Holiday House. Mar. 2017. $17.95. ISBN 9780823436750. Gr 4 Up–There is no hyperbole in this title. All of the women in this book are splendid role models whose work impacted the world in significant ways. The author devotes an informative and accessible chapter to each of her subjects, making this selection a great choice for a wide range of readers. The thumbnail biographies describe early life events that influenced the women's career tracks, their educational and career trajectories, research and accompanying discoveries, and the prejudicial attitudes and behaviors they encountered. Lawlor excels in conveying the excitement and importance of each person's adventurers and accomplishments, such as ichthyologist Eugenie Clark’s eye-to-eye swim with the largest breed of shark in the world, and mathematician Katherine Coleman Johnson’s perfectly calibrated variables, which launched and landed a 66,000-pound rocket. Occasional photographs of the women show them at work. McCully, Emily Arnold. Caroline’s Comets: A True Story. illus. by author. Holiday House. Mar. 2017. $16.95. ISBN 9780823436644. Gr 1-4–McCully imbues her biography of the 18th-century astronomer Caroline Herschel with vivid details of time and place. As a child, Herschel suffered from both typhus and smallpox. When she was not ill, she served as maid to her parents and brothers. The scientist's words selected from her letters and memoirs illuminate the narrative with her sardonic comments. Of sifting horse manure to aid her brother in making a mold for a mirror, she wrote, “it was an endless piece of work and served me for many an hour's exercise.” Nonetheless she traveled with her brother William to England, where together they built a state-of-the art telescope. In addition to discovering a number of nebulae and two galaxies, Herschel is recognized as being the first woman to discover a comet. McCully’s trademark watercolors illustrate this account of one woman’s irrepressible intellect and her triumph over incredibly restrictive social mores. All in all, a winning title. However, McCully’s statement that typhus causes stunted growth in children may need further explanation. Stanley, Diane. 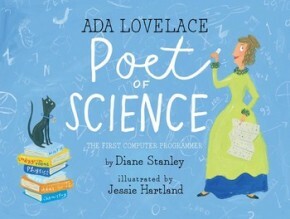 Ada Lovelace: Poet of Science. illus. by Jessie Hartland. S & S. 2016. $17.99. ISBN 9781481452496. Gr 1-4–Similar in scope to but drastically different in presentation from Laurie Wallmark’s Ada Byron Lovelace and the Thinking Machine, this picture book biography is a winner from first page to last. The breezy, conversational tone of the narrative brims with insight into Lovelace’s personality, 19th-century technology and gender roles, and concise descriptions of the scientist’s complex work, which led her to be called the first computer programmer. Stanley’s selection of only the most pertinent and engaging events in Lovelace’s life make her accessible and engaging to young readers. One anecdote describes a time in the mathematician’s childhood when she made plans to build wings so she could deliver mail while flying, conveying with charming conviction her creative and analytical mind. Hartland’s gouache illustrations cheerfully and whimsically evoke Lovelace’s out-of-the-box thinking. A delightful and informative book Collective Biographies Anderson, Tanya. 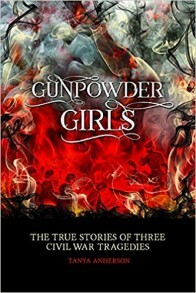 Gunpowder Girls: The True Stories of Three Civil War Tragedies. Quindaro. 2016. $16.95. ISBN 0966925874. Gr 7 Up–In Anderson’s hands, history is as riveting as any best-selling novel. The author discusses both the social and economic circumstances that prompted many women and girls to seek work in munitions factories during the period; the work, including its tedium and danger; and the poor training employees received. As she describes what led up to the explosions, Anderson weaves in eyewitness and newspaper accounts of the disasters. These primary and secondary excerpts lend emotional immediacy to the narrative. One newspaper account details how the only things identifiable after an explosion were the “bodies nearly burned to a cinder, being caged, as it were, in the wire of their hooped skirts.” The illustrations consist primarily of period photos of the factories, diagrams of their floor plans, and drawings of the factory-made products. Solid research and engaging writing. Doyle, Caitlin. 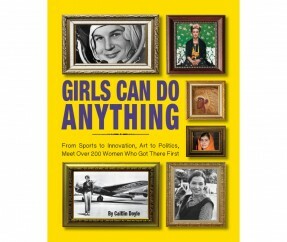 Girls Can Do Anything: From Sports to Innovation, Art to Politics, Meet over 200 Women Who Got There First. illus. by Chuck Gonzales. Firefly. 2016. $29.95. ISBN 9781770857704. Gr 6 Up–Concise, informative, and beautifully presented, this compendium is just about perfect. The women represented each receive a one- or two-page biography covering the basics: vital stats, claim to fame, and career highlights. Subjects from ancient times to modern day are included, but the focus is Western. The small font may discourage some readers, but the writing is so engaging that most aren’t likely to mind. Illustrations consist of exquisite pencil and ink portraits of the women and images of places and things relevant to them—a pair of ice skates on Sonja Henie's page, a set of black-and-white checkered flags on Danica Patrick’s, and so on. Fun to browse and informative. Krull, Kathleen. A Kids’ Guide to America’s First Ladies. illus. by Anna DiVito. HarperCollins. 2017. ISBN 9780062381064. Gr 4-8–From Martha Washington to Melania Trump, all 45 FOTUSes are included. 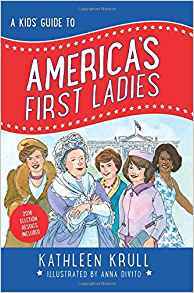 Well-known first ladies such as Mary Todd Lincoln receive their own chapter, while the lesser-known Sarah Polk, Margaret Taylor, Abigail Fillmore, and Jane Pierce share chapters. Krull offers fascinating—and positive—tidbits about each individual, and insofar as it is possible, she includes each woman’s impact on her husband and his presidency. It's possible that Krull’s assertion that no image of Margaret Taylor survives is outdated. One may have come to light in the late 1990s. DiVito’s black-and-white line drawings exhibit a range of moods—sometimes earnest (Lucretia Garfield having tea) or silly (a first ladies’ selfie). The mix complements the text, which is mostly light in tone, though it does describe the various challenges each first lady faced. A timely addition. Macy, Sue. Motor Girls: How Women Took the Wheel and Drove Boldly into the Twentieth Century. National Geographic. Feb. 2017. $18.99. ISBN 978142632974. 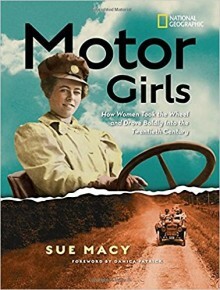 Gr 4 Up– Similar to Macy’s outstanding Wheels of Change: How Women Rode the Bicycle to Freedom (with a Few Flat Tires along the Way), this work is a terrifically entertaining and informative look at how the advent of automobiles shaped women’s history. Chapters cover a host of firsts for women and cars: races, laws, attitudes, long-distance drives, and war work. The author incorporates numerous primary source documents to support the content. By today’s standards, some of the quotes from these documents are outlandish, but they accurately reflect the period mores. For instance, in 1914, a man wrote in to a motoring magazine: “[Women], as a whole, are utterly unfitted to pilot ships, command armies, or operate automobiles, and through no fault of their own. They were born that way.” The professional stock car racer Danica Patrick’s articulate, inspiring foreword is a boon. Young readers will be thoroughly entertained. Roberts, Cokie. Ladies of Liberty: The Women Who Shaped Our Nation. illus. by Diane Goode. HarperCollins. Dec. 2016. $17.99. ISBN 9780060780050. Gr 2-5–In her follow-up to Founding Mothers: Remembering the Ladies, Roberts provides breezy summaries of the contributions of 10 women of early America. With the exception of Sacagawea, these women are likely to be unfamiliar to children—women who by dint of their talent at writing, teaching, or charity work informed and helped the young United States grow into the nation it is today. How Martha Jefferson Randolph and Elizabeth Kortright Monroe did that is somewhat unclear, but the work of others is clearly articulated. Goode’s sepia-lined watercolors are full of period details, right down to the shape of the sleeves on the dresses. A useful, but additional, title to round out the history collections. Jennifer Prince is a youth services librarian in NC, and the author of The Handy Bible Answer Book and The Life and Times of Asheville's Thomas Wolfe. 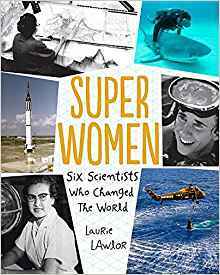 For additional nonfiction titles of women of note, see Joy Fleishhacker's Disrupters, Daredevils, and Artists: Women Who Changed the World and 15 STEM Titles To Celebrate Women, and visit School Library Journal's Women's History Month Pinterest board.